Updated amounts. Enjoy the snow!! Here it is. Amounts may need to be adjusted a little. Happy snow!! Here is the graphic for your return trip. This is in effect friday morning through saturday afternoon. 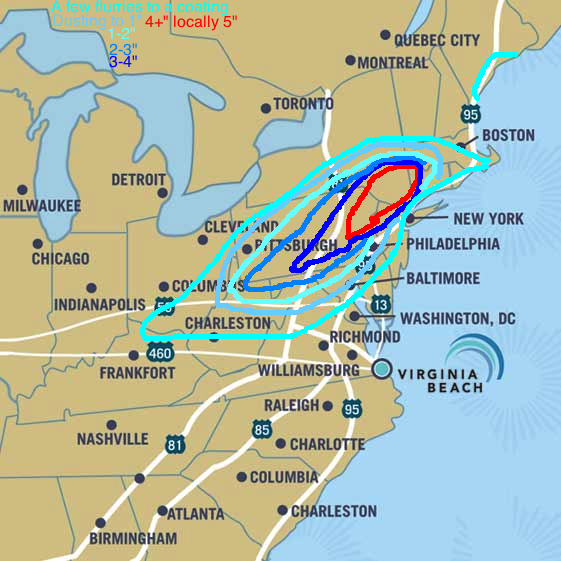 Red areas are were to expect major slowdows due to weather. Yellow areas show where delays are possible. Green areas are all clear. Note: local areas in the “green zone” could have minor slowdowns due to local weaather eg. fog; black ice. Have a safe return trip! I am watching a potential storm early next week. Stay tuned for any updates. Fairly quiet this week as Thanksgiving travel goes smoothly nation wide. Other than the North Western states where a storm will continue to bring incliment weather well into the week. There is a good potential for a low pressure area to form off the SE US coast. Weather it goes out to sea or moves right near the coast has yet to be determined.